Recently our son has gotten very picky about which books we read him before he goes down for his nap and before he goes to sleep at night. He’s done this before. There was at least a six month period when all we read were Lenny and Lucy and Goodnight Tractor over and over and over again. Both are great books, but by the thousandth time they start to wear on you a little bit. The last month or so he’s been dedicated to the “Little Critter” book series. We have probably 20 or more of these books. Most of them were actually mine when I was little. My mom lovingly saved them, as she often does, and now they are in a new bookshelf in my own son’s room. The inside cover of each book says “This book belongs to:” and many of them have either my mom’s handwriting or my own to show that, yes, they are mine. I have no specific memories of reading these books as a child. I may have gone through similar phases like my child and wanted to read them over and over again. But even without these specific memories in my brain, as I first started to open these books again after a thirty year hiatus, the pictures on these slightly yellowed pages spoke to me in ways that seem impossible. I felt very real emotional responses to pictures that I hadn’t seen in nearly three decades. But yet here I was, rocking my child and reading to him and knowing in my bones that this book mattered to me at some point in my life. It’s an unnerving feeling to both remember and not remember simultaneously. I’m happy to know those memories are maybe still buried away somewhere deep inside my psyche, but saddened to think of all the good stuff from my life that I’ve long ago forgotten about. Audra and I often talk about the life that Lincoln may or may not have on our little farm. He’s showing us more and more each day that he seems to be right where he belongs in this role as Farm Boy. We wonder what things he’ll remember from these early days, what things we’ll have to remind him of later in life, and what things we’d wish him to forget (i.e. the STILL ongoing process of cutting his second set of molars). We feel so blessed to have so many of these special moments with him, but it’s occasionally hard to accept the fact that he’ll likely not remember any of this past year, and maybe none of the following one. That memory thing can be a dirty skank sometimes. We’re trying to remember a lot around here these days. As we wrote about almost exactly a year ago, we’re starting our season once again in our basement, planting seeds and placing them under grow lights. As much as we try to take detailed notes about everything we do, we’re confident that we’ll be re-learning some lessons already learned from our efforts and mini-failures last year. That’s okay though, we like to learn. 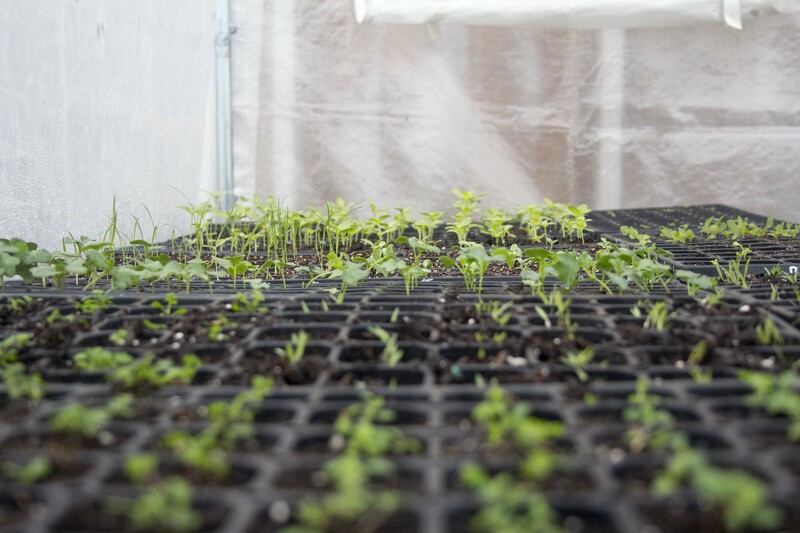 Right now our basement is full of seed trays, our mini-greenhouse inside our hoop house is close to capacity, our hoop house itself is half full of climbing sweet peas, tulips and daffodils ready to bloom, and a stray anemone that the evil voles have left for us to enjoy. We’re still figuring this all out, but man alive have we come a long way in a year’s time. We can’t wait to see what this next year has in store for all of us. It’s hard to say what this dream will look like in two or five or ten years. It’s even harder to say what we’ll remember from these early years of trying to figure out where the dream is taking us. There’s a great poem by Langston Hughes that I teach called “Harlem.” The poem’s central question is, “What happens to a dream deferred?” It then goes through a series of metaphors that express all the different, horrible things that dreams that don’t come true tend to become. Regardless of what my son remembers from his early days on this farm, and regardless of the dreams that life has in store for him, we hope that we’re at least instilling in him an unwillingness to put his dreams on hold, a desire to keep searching for fulfillment, and an ability to work his tail off to find and keep that fulfillment in his life.